TBS Boar Folding Pocket Knife. When it came to the non-locking pocket knife version of the Boar we decided to offer it in N695 Stainless Steel as, quite simply, it requires less maintenance. This is important for a knife that will be in your pocket the vast majority of the time picking up all sorts "pocket fluff" and salt from perspiration. We also, quite deliberately, did not put a thumb stud (or similar) on the EDC as this makes it a much more user friendly product in many more Countries of the World where, to carry a knife all the time, it needs to be a product that needs to be opened two handed. Obviously this makes it a much more useful knife for travel but in all cases you should check local laws and by-laws prior to visiting or purchasing in your chosen country. There is now a wider choice in the handle material between a Super Grade Curly Birch, Turkish Walnut, Natural Micarta, Stag Antler or Canvas Micarta. All the materials have their obvious qualities and are all easy to maintain and look great. 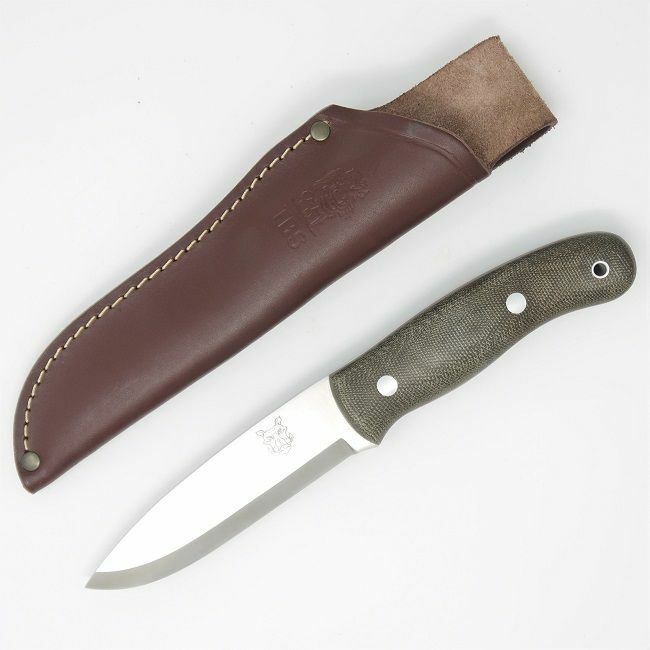 It is handled in a choice of Micarta, which is a great material for the task as it not only looks great it is VERY easy to maintain as they pretty impervious to most things, Curly Birch, Turkish Walnut or Stag Antler which is also a great looking material and very easy to maintain. The handles are also wonderfully ergonomic and fit the hand perfectly for hours of hard work. This is a perfect "EDC" pocket knife as it has a 70mm non locking blade but has all the features of its bigger brothers. Lanyard not included. High Grade Bohler N695 Stainless steel which has a high hardness and great wear resistance and is one of Bohlers premium stainless steels. We have decided to make the EDC knife in this steel as, after quite some testing, we have found that it performs extremely well. It has a higher Carbon content that many other stainless steels which means it holds an edge longer and can be tempered to the same degree as Carbon Steels. This particular steel actually has a higher content than many High Carbon Tool Steels. This makes it perform with pretty much all the benefits of Carbon Steel with the added bonus of great corrosion resistance. Our knife range is manufactured from high quality European materials by a top, well known, European manufacturer in small batches; they are NOT churned out in their thousands in a factory in the Far East. This allows us to have ultimate control over quality and materials and we are extremely happy with the results. All models of knife will be logoed with the Boars Head. Curly Birch, Natural Micarta, Turkish Walnut, Olive Wood, Canvas Micarta, Stag Antler.